Hey, guys! Happy Friday! Before I start, I sincerely apologize for breaking my promise yesterday. When I wanted to start writing, my dang Internet broke off for the whole night plus throughout today (albeit irregularly) until now. 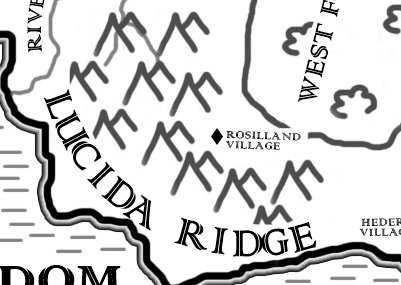 Anyway, I'd like to introduce Rosilland Village, one of the major locations in Seriquas. Rosilland Village (rɒz'ɪlænd; RAWHZ-zee-land) is where protagonist Cassandra Monica spends her life before beginning her journey. It is on the southwestern side of Seriquas, surrounded by the skyscraping Lucida Ridge and the nearby West Forests. The village is protected by a six-storey high wall (the only walled village in Seriquas) and a royal guard is always standing at the gate entrance. A single trail connects Rosilland to the rest of the human settlements. Outside the walls, flowery meadows sprawling with mostly roses (hence its name), and other flowers such as dandelions, tulips, marigolds, and the like. Rosilland's village head is Darwin. The village isn't that large nor is it advanced. Its houses are made of wood and straw and the dirt pathways are lit with lanterns at night. Every morning, a market opens up for residents by the church, its bell tower marking the highest point in the village. Cassandra's house is located at the rightmost side of the village, near the wall. Rosilland is also where Cassandra's mother, Eleanor, and childhood friend, Melissa Trixton, live. 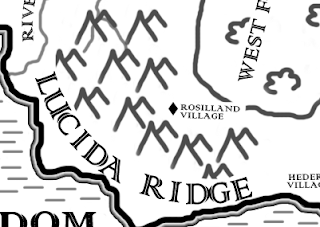 The closest settlement from Rosilland is Hedera Village, which takes roughly twenty hours to reach by foot. The distance from Rosilland to Evrysa is approximately three to five days to reach by foot.